Bangor City Council finalized a deal Wednesday night to sell one of the city’s blighted properties to a developer who has plans to transform the building into quality, affordable housing units. The otherwise unremarkable sale accomplishes two things the city desperately wants: the return of one of the city’s many tax-acquired delinquent properties to the tax rolls, and the creation of more affordable housing options for Bangor residents. Wednesday’s deal allows developer John Karnes to buy the once stately, now placarded building at 472 Essex St. for just more than $4,000. Per an agreement with the city, he will renovate the property into a building where three of the four one-bedroom units are rented at fair market value. “The city has been really trying to make this work out well. This building has reached its outer limits of re-use. At one point, [the city was] looking at tearing it down,” Karnes said in a phone interview Thursday. After he fixes it up,“it [will be] a good piece of housing stock that will be around for another 40 years at least,” he said. The sale comes at a time when the city has convened a work group to study ways to shrink a dearth of affordable, good quality housing in the Bangor area. In Karnes’ case, adding four more of those units doesn’t come close to what’s needed to solve the problem, but his willingness to invest in the run-down property represents the kind of buy-in from private developers that the city likely will need. City officials say that limited supply, combined with residents’ low median income, have contributed to a housing crunch that’s made Bangor less affordable than the entire state of Maine, including Portland, the state’s largest and rapidly gentrifying city. In Greater Bangor, nearly 60 percent of renters devote more than 30 percent of their income to housing, which is considered a cost burden by state and federal standards. Bangor officials have acknowledged that the city’s old housing stock means affordable units are not always in great condition. But making repairs can be expensive for property owners and developers, who aren’t always incentivized to do so, Karnes said. 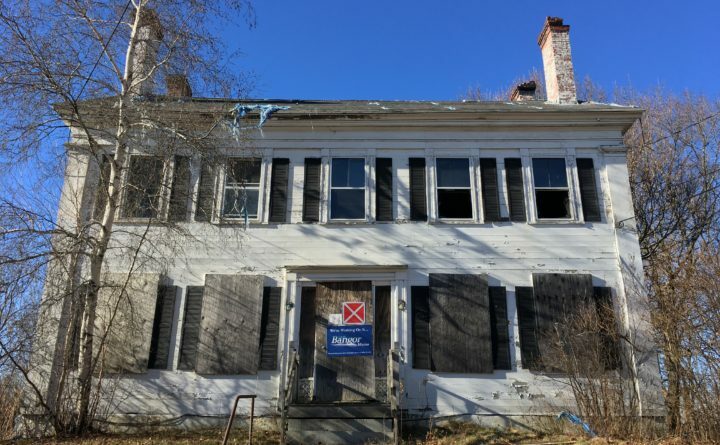 For similar reasons, Jeff Wallace, Bangor’s code enforcement officer, said it isn’t always easy for the city to sell its tax-acquired buildings because they often require costly renovation or maintenance. The city owns 14 such buildings, and two are placarded. Apart from what the city owns, there are more than 150 placarded buildings in Bangor, meaning they are abandoned or unsafe to live in, he said. Karnes’ purchase of the placarded Essex Street property chips away at both tallies. The city foreclosed on the property in August 2017, according to BDN archives. The city initially planned to demolish the building but worked out a deal with Karnes when they realized he was interested in buying it. Karnes said he and the city split the cost of removing asbestos from the property. Going forward, the builder plans to sink $320,000 of his own money into the renovation. Part of the purchase agreement requires him to rent three of the four units at fair market value, which is $740 a month in Bangor, according to the Maine Housing Authority.